Kymco DJ 50 S, Available in Red or White, £1371 â€œOn the Roadâ€ inc Road Tax,etc, £99 minimum deposit, 36 monthly payments of £42, Please contact us for a full personal quote. The DJ 50 promises to rival all other entry level 50cc models in terms of build quality, stylish design and value for money. 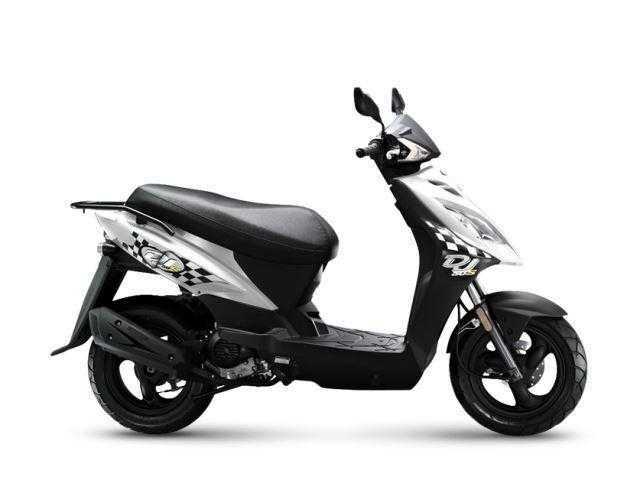 Powered by a 50cc four-stroke air-cooled engine with an automatic transmission, the KYMCO DJ 50 is a comfortable and easy bike to ride in the town or country. It features powerful front disc and rear drum brakes, a fuel tank capacity of 6 litres, a centre stand, rear carrier, lockable storage box under the seat â€“ making it ideal for shopping trips â€“ and has both electric and kick.